Among other useful features, The National Voters’ Services Portal (NVSP) allows us to search for voter data by entering the Electoral Photo Identity Card (EPIC) number or voter name. Unfortunately, the data we get with this query refers to an older version of the electoral rolls, though the result claims to have been updated on the date of query – misleading us further. This is an old (and ignored?) problem. Exactly two years ago, I reported to the Chief Election Commissioner (CEC), his Director, IT, and the Chief Electoral Officer, Karnataka (CEO-KA), about this issue. Since then I have written to them on the issue several times. The dissonance in data between NVSP and CEO-KA website continues. CEO-KA organization has shuffled the voters across parts in the version of the electoral rolls published on 30 Nov 2017 and on 28 Feb 2018. In the latest version, part number and serial numbers of lakhs of voters have changed, which does not reflect in the query results at NVSP because even after 22 days of publishing the new version of the rolls. NVSP refers to the previous version. For example, consider serial 1 of AC1690156.pdf published on CEO-KA website on 30 Nov 2017. Its EPIC# is LRJ0993428. Search by the EPIC Number at NVSP website shows a result of the record at AC1690156, serial 1. The site also states that the record is updated today, 22/03/2018. Search by the above EPIC Number at CEO-KA website shows a result of the record at AC1690128, serial 883. It indeed is in that part now. If the voter refers to NVSP site of ECI and visits the polling booth at R.V. Teachers Training College, Room No 4 for part 156 of Chickpet constituency, he will not find his name on the rolls and would not know what has gone wrong. If he trusts the data at NVSP, he will lose his voting right though his name is on the roll elsewhere and his polling booth is Sri Saraswathi Vidya Mandira Room No-4. It is unlikely that NVSP data will be synchronized with ERMS Karnataka before the assembly elections. I have requested the EC and CEO-KA that NVSP should not provide any link to the data on Karnataka voters till the elections are completed. It is unlikely that they will consider this request either. Also, as accepted in writing by a District Electoral Officer (DEO), more than 66% of the applications submitted online through NVSP are not processed. The reason for the forever-delay or rejection is not communicated to the citizens who submitted the applications. In the interest of voters, please do not trust the data and various services at NVSP. 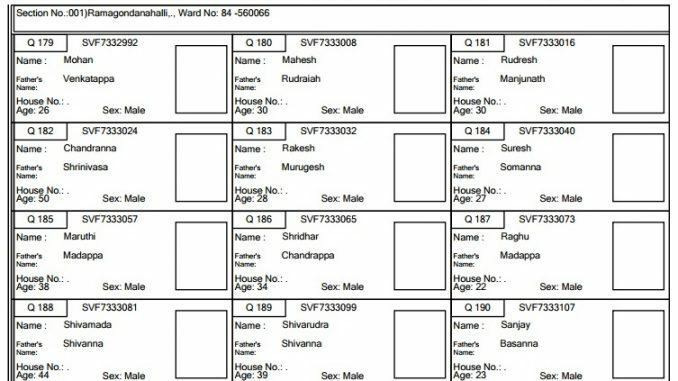 While some errors in Bangalore’s voter rolls are due to technical issues, some errors are completely avoidable. Understand why the errors creep in, and do your bit in reducing them.